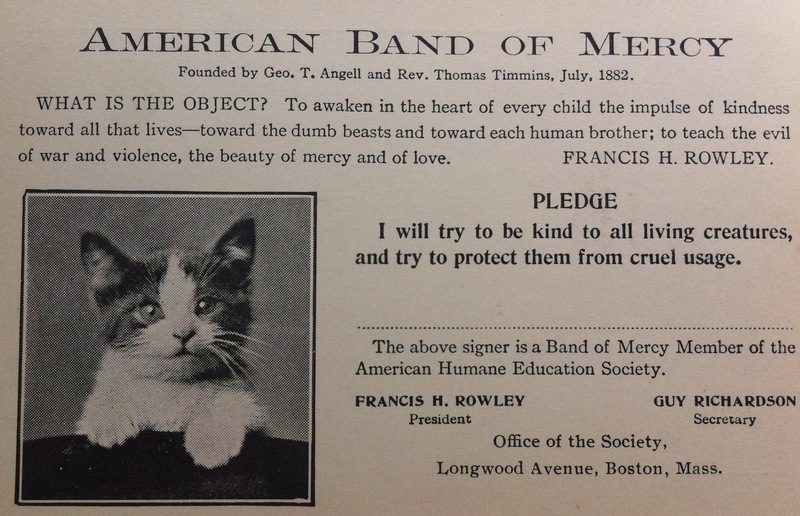 The American Band of Mercy membership cards were double-sided, printed on heavy card stock and feature a different image of an animal (typically a cat or a dog) on the front. This image serves as an important visual reminder of the Band of Mercy pledge that each member took. While in most cases the image on the front of the membership card was of a single dog or cat, that animal stood as a symbol of all creatures in need of care and protection. 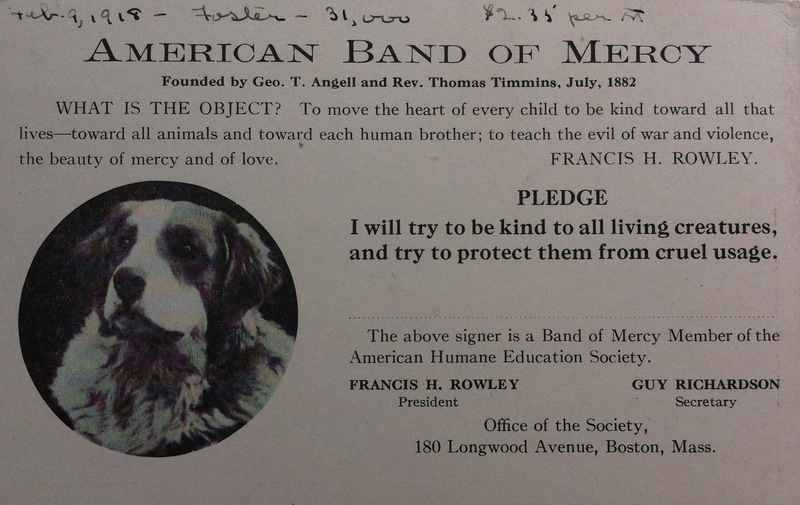 American Band of Mercy membership card, n.d. Collection of MSPCA Angell. American Band of Mercy membership card, c.1918. Collection of MSPCA Angell. The front of the card explained the object of the American Band of Mercy (“to awaken in the heart of every child the impulse of kindness toward all that lives”), reprinted the pledge that each member took, and offered basic information about the Band of Mercy movement in the United States. And human hearts are asking for this blessing only–That we be kind. But love can shine upon the way today, tomorrow–Let us be kind. Upon the wheel of pain so many weary lives are broken. The inclusion of this poem and list on the back of the membership cards, ensured a constant and portable reminder of the principles underlying the Band of Mercy movement. Hundreds of these membership cards were carried in the pockets and wallets of children across the United States.